Based on simple computer simulations, we found that even in the limit of sparse ion noise, signal to noise ratio and not signal alone is the important parameter for sensitivity and chromatography quality evaluation. For the same total ion count (TIC) signal to noise ratio, surprisingly lower signal enables superior sample identification. We recommend the use of a mixture with few compounds for the evaluation of relative GC-MS systems sensitivity via the measurement of their relative TIC signal to noise ratios. In this short post we explain how we reach these conclusions, and provide you with the (free) simulating software we have used for this purpose. In mass spectrometry and particularly in MS-MS, sometimes one encounters a situation in which the noise is composed of only few ions that are randomly distributed around the target compound peak. Such peak might be weak, being composed of only a few ions, and therefore with poor ion statistics, and as a result poorer than desirable reproducibility. These encounters with sparse ion noise naturally spark the desire for higher signal, but usually without proper consideration for the noise which we tend to neglect. However, as will be shown below, the most important and valuable parameter for our consideration should always be the signal to noise ratio and not only the signal itself. Recently, the comparison between the main vendor's GC-MS systems sensitivity became difficult, and even questionable, in view of various "tricks" that are used by some of them in their system sensitivity specification and acceptance tests (read more about these "tricks" in Prof. Amirav's post here). This situation emerged from the fact that all the main vendor's specifications for 1 pg OFN RSIM on m/z=272 are within a factor of only 2. Thus, a search is being made to find another more appropriate method for system sensitivity specification and evaluation and the use of signal alone is being considered via the use of SIM with OFN and the measurement of its RSD which is inversely proportionally to the square root of the number of OFN ions. This state of affair raises the question of "what is more important for sensitivity evaluation, including for MS-MS, is it signal alone (number of ions) or signal to noise ratio". In this short note we conclude that only signal to noise ratio is important, that noise can never be ignored unless in very rare situations when there is zero noise and infinite S/N, and that a new GC-MS system sensitivity evaluation tests should be introduced that will make it much harder to employ the currently used "tricks" of artificial sensitivity specification increase. 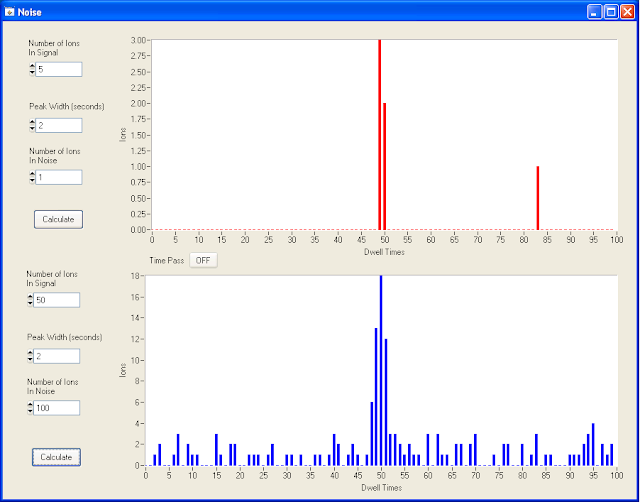 In order to demonstrate the central importance of S/N versus signal alone we have created a simple software that simulates random chromatographic noise and peaks which are Gaussian envelopes with random number of ions per mass spectrum for a given number of total ions in that peak. We used this software for the simulation of several situations in which the signal to noise remains the same but the number of ions is increased. The main point to realize is that for the same signal to noise ratio, if we increase the signal by a factor X, the number of noise ions also increases, but by a factor of X^2 which is not intuitive. However, while the noise level (baseline) increases linearly with the number of ions the noise fluctuation which is the noise in S/N, increases only as the square root of the number of baseline ions. 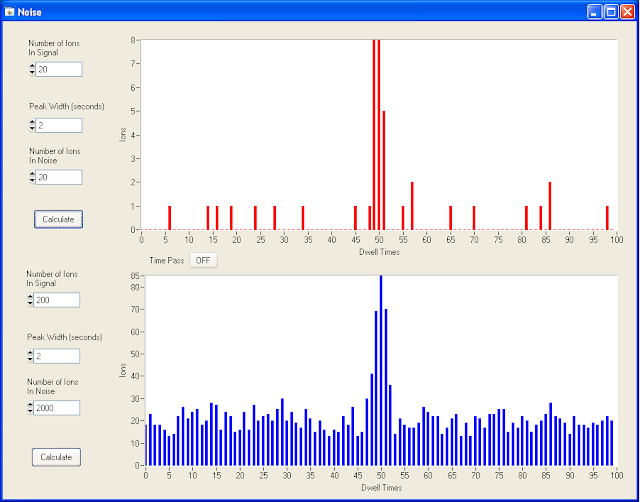 In Figure 1 below we demonstrate a simulation of a chromatogram with low number of signal and noise ions, and the effect of increased signal on it while keeping the same signal to noise ratio. In these simulated chromatograms each ion is simulated by a bar with unit height. Figure 1. Sparse ion chromatogram with 5 signal ions and one noise ion (upper) compared with the same chromatogram but with 10 times higher signal and 100 times greater number of noise ions hence having the same signal to noise ratio in RMS. While some will find the upper chromatogram more agreeable, others will prefer the lower chromatogram, but it is important to realize that scientifically they are with the same quality. In Figure 2 below we show the same type of simulation but now with 20 signal ions and 20 noise ions that are increased correspondingly 10 and 100 times. Again, it is a matter of subjective taste which is better but they are the same in their signal to noise ratio. In addition, the signal with 20 ions has RSD of ~22% but even if the signal fluctuations could be reduced, the baseline noise will limit the gain in having lower RSD. Figure 2. 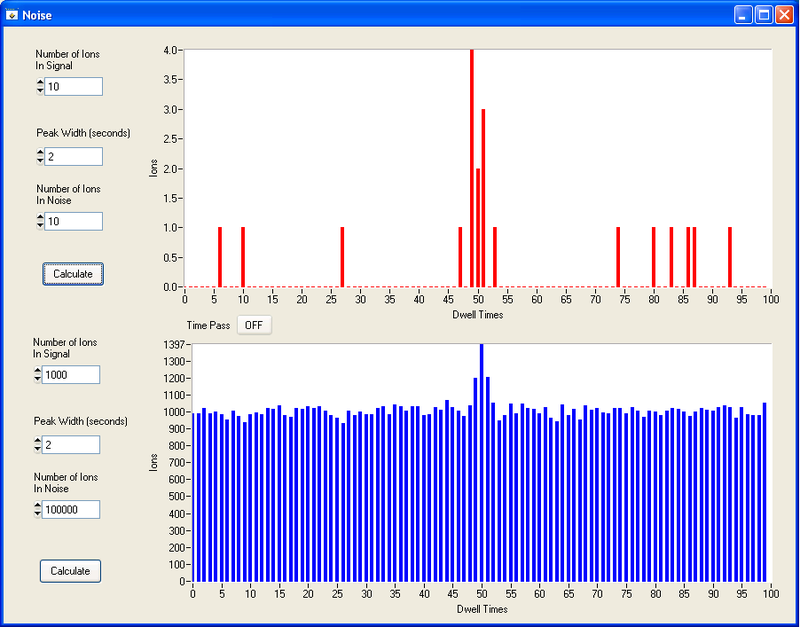 Sparse ion chromatogram with 20 signal ions and 20 noise ions (upper) compared with the same chromatogram but with 10 times higher signal and 100 times greater number of noise ions hence with the same signal to noise ratio in RMS. In Figure 3 we show a situation in which a larger increase in both number of signal ions and noise is used for the same S/N. 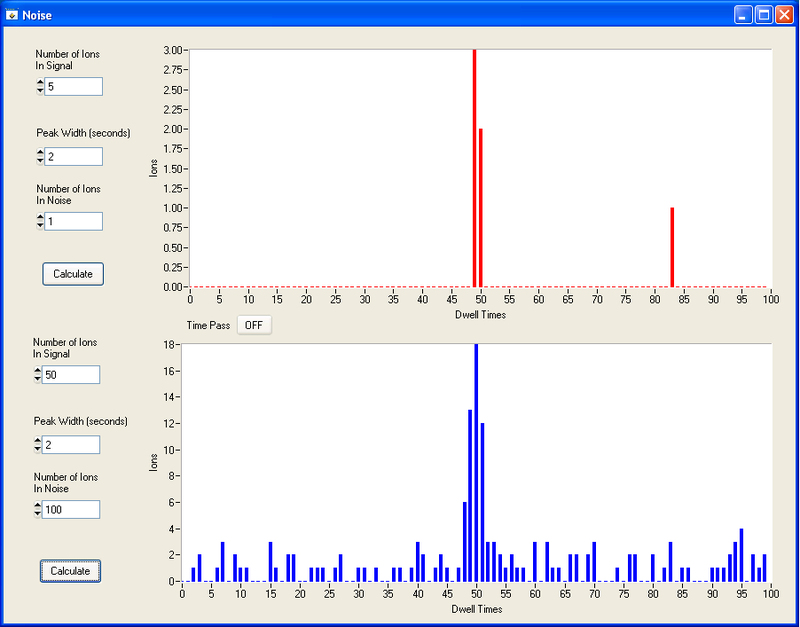 This simulation demonstrates another unexpected effect of reduced limit of identification via increased signal (for the same chromatographic peak S/N) since while both chromatograms have the same total ion chromatogram (TIC) signal to noise ratio, the much larger increase in baseline number of MS ions implies that the generated mass spectrum will be hampered by noise ions and library search or any other form of identification will be impeded. Figure 3. 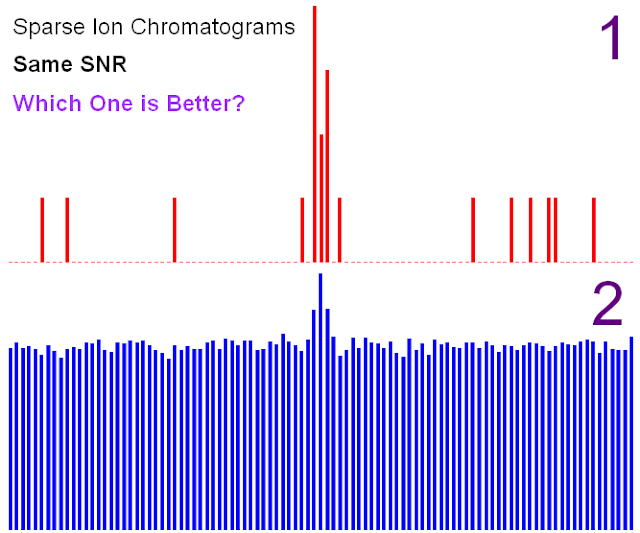 Sparse ion chromatogram with 10 signal ions and 10 noise ions (upper) compared with the same chromatogram but with 100 times higher signal and 10,000 times greater number of noise ions hence having the same signal to noise ratio in RMS. Increasing the number of signal ions without corresponding increase in chromatographic peak signal to noise ratio does not improve the value of that chromatogram. This conclusion does not contradict the usual drive of MS instrument developers of ever improving the system signal since usually the increased signal comes with a similar increase in the number of noise ions, resulting in an improved S/N (by a factor of the square root of the signal gain). One the other hand, an unexpected result is that for the same chromatographic signal to noise ratio, the chromatogram with the lower signal and lower noise should generate a higher quality mass spectrum with superior identification potential. Naturally, we all want both higher signal and lower noise but for the sake of system performance comparison, only signal to noise ratio matters when it is appropriately measured. Consequently, the way to compare the sensitivities of different GC-MS systems must focus on signal to noise ratio, but not of OFN in RSIM since OFN RSIM traces have too low noise that enables easy use of software tricks to generate any desirable (not real though) S/N number. We suggest using a chromatogram with few compounds that include an easy to analyze compound such as OFN plus additional compounds with increasing difficulty such as n-C16H34, methylstearate, cholesterol and n-C32H66 which elute near the column bleed plateau. This way the evaluation will measure the TIC signal to noise ratio, which is the ratio of total ion signal - the signal averaged on several masses for several compounds as well as baseline noise which is an average noise of all masses in the scanned mass range of 50-500 amu. Such evaluation also includes the effect of peak tailing, molecular ion abundance, transfer line cold spots and all other relevant GC-MS parameters for standard analysis. It is important to realize that such TIC signal to noise ratio measures both signal and noise in their correct way, since this S/N linearly increases with the signal while being reduced only by the square root of the number of noise ions. We currently use this method and mixture (purchased from Restek) for the evaluation of our Supersonic GC-MS.
Hi! so establishing S/N using RMS is acceptable or PtP (Peak to peak) is the right approach. since we are planning to validate one method on GCMS and we are facing some issue in getting S/N by PtP method but by RMS it is very well in the acceptable range. is it ok if we perform our validation using RMS approach.